Gulf Strike - Scenario 1: The Russians are Coming! It is turn 8 and this is the big enchilada now. WW3 starts this turn as both the Soviets and US are now activated. They have 100 supply points allotted to them. Nothing happens in terms of random political events. The Soviets get a bunch of reinforcements and I'm left scratching my head as to where exactly these guys should go. The Soviets get: 7 x Airbases, 6 x Su-24, 15 x MiG-21, and a Tu-126. 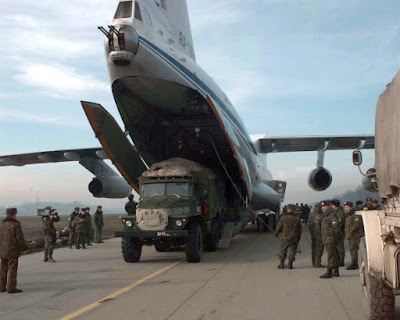 They also get 6 x trucks, 6 x air defense units, and 9 x airborne regiments, all delivered by IL-76. This is way more than can be delivered by IL-76 in a single turn, even though, as the scenario special rules state, the IL-76 can fly twice per turn for the first 3 turns of Soviet activation. I'm not sure where to put all this new stuff. Throughout my three planning turns, I tried my best to allocate most of my resources on getting my aircrews, upkeeps, and ground crew ready for the raid.